About "Congruent Triangles Worksheet with Answer"
Worksheet given in this section is much useful to the students who would like to practice problems on proving triangle congruence. Check whether two triangles PQR and WXY are congruent. 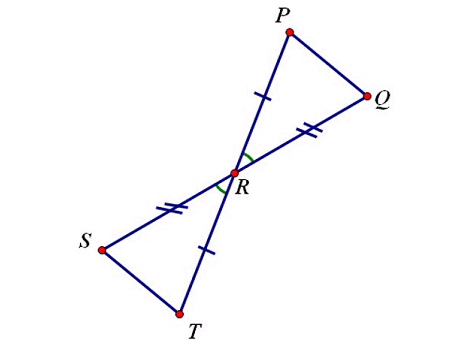 Check whether two triangles PQR and JKL are congruent. Check whether two triangles PQR and ABC are congruent. Check whether two triangles PQR and CDE are congruent. Check whether two triangles PQR and STU are congruent. (i) Triangle PQR and triangle WXY are right triangles. Because they both have a right angle. (i) PQ = XY (Hypotenuse). Hence, the two triangles PQR and WXY are congruent by Hypotenuse-Leg theorem. Hence, the two triangles PQR and JKL are congruent by SAS postulate. Hence, the two triangles PQR and ABC are congruent by Hypotenuse-Acute Angle theorem. Hence, the two triangles PQR and CDE are congruent by ASA postulate. Hence, the two triangles PQR and STU are congruent by SSS postulate. Hence, the two triangles PQR and RST are congruent by SAS postulate. After having gone through the stuff given above, we hope that the students would have understood "Congruent triangles worksheet with answer". Apart from the stuff given on "Triangle congruence and similarity worksheet", if you need any other stuff, please use our google custom search here.